The final day of 2018 graduation ceremonies at Wrexham Glyndŵr University has concluded. Students studying Art and Design, Communications Technology, and Computing courses received their awards in this morning’s ceremony. 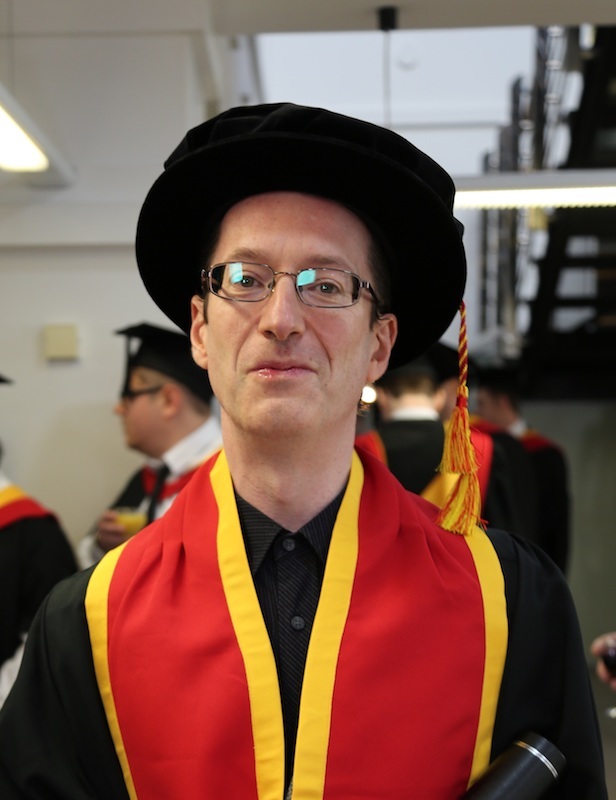 Internationally-renowned concert pianist Dr Llyr Williams, from Pentrebychan, was made an Honorary Fellow of the university for his services to music at the ceremony. Instead of making a speech, Dr Williams performed Schubert’s 4 Impromptus, D.899: No. 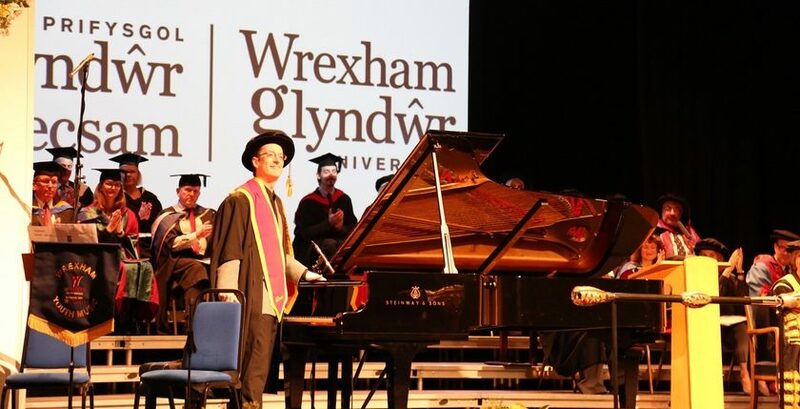 3, Impromptu in G Flat Major on a Steinway grand piano as a mark of acceptance of his Honorary Fellowship. Widely admired for his profound musical intelligence and the expressive and communicative nature of his interpretations, Dr Williams gained a First Class Honours Degree in Music at Queen’s College Oxford. He was awarded a scholarship to the Royal Academy of Music in London where he is now a Fellow. Dr Williams was later selected as a BBC New Generation Artist and he was one of the first to be awarded the prestigious Borletti Busoni Award. In 2017 he was awarded an Honorary Doctorate by the University of Wales. Following a widely acclaimed debut recital at the Edinburgh International Festival in 2003 his career flourished both as a soloist and accompanist. He has given recitals throughout the United Kingdom and Europe. He made his American debut at the Carnegie Hall and has performed at most major centres there. He recently made his debut in Moscow and he will be returning in the near future to present a further eight concerts. Llŷr has been one of the two official accompanists at the BBC Cardiff Singer of the World Competition since 2003. He is Artist-in-Association at the Royal Welsh College of Music and Drama where he is an Honorary Fellow. He is an acclaimed performer of Beethoven having performed complete piano sonata cycles including one which won the prestigious South Bank Show award. A set of cds containing all Beethoven’s solo piano works recorded live at Wigmore Hall was released earlier this summer. Wrexham Glyndwr University Vice-Chancellor, Maria Hinfelaar, told graduates: “I hope that you will look back on your time here with great affection as a rewarding experience. “Armed with a qualification, you now leave us with the ability to grasp your future positively – for yourselves, your family and friends, your colleagues in the workplace and for your communities. “You will be able to contribute actively to society, much in the same way that we as a university take our responsibility towards our students and towards the community very seriously. “Today, though is about enjoying the moment. Have a lovely celebration later on; you deserve it. “And for the future, I wish you pob lwc, iechyd a hapusrwydd da – good luck, good health and happiness.